Pet-proofing your home is hardly a new concept. Certain pets are prone to certain destructive tendencies, and even a well-trained animal can still make a mistake from time to time. When it comes to screen doors, claw marks can certainly build up over time. Claw marks may be caused from your pet hassling to come inside, sharpening their claws, or swatting at bugs across the other side of the screen; occasionally abrasions and discolorations from pets sitting against the screen; and a large enough breed of dog can simply barge its way through an old flimsy flyscreen. Luckily, there are a number of easy steps you can take to prevent a pet from wreaking havoc on your screen door. There’s a reason you don’t teach a cat to sit, and that is because they’re basically impossible to train. You can teach them good or bad habits, but most of them have a mind of their own and, depending on the cat, they might just wait until you’re not there to keep doing it anyway. If you have a cat that loves to sharpen its claws on the edges of a screen door, your first port of call should be to deter it through negative reinforcement. If the cat learns that sharpening its claws on the screen door is suddenly much more unpleasant than it used to be, it’s less likely to keep doing it. Enter scratch deterrent. You can get a bottle of this fairly cheaply from most pet stores, and it’s a heavy, odourless spray that you can spray right on your door. Once scratched, however, it releases a smell that most animals hate. Keep it up for a couple of weeks (or however long it takes), and soon your cat will stop scratching the screen. If you have a bit more time, the old classic spray bottle can work well. Simply fill a spritz bottle with water, and spritz your cat or dog whenever they begin to scratch (if you don’t like soaking your pets, get something that makes a loud jarring noise, such as an electronic device or a bunch of loose change in a can). It’s important to only do this once they’ve already started scratching, or they won’t get the right message, however the harm may already be done by then. On top of that, while it’s a simple solution, it requires you to be in view of the door whenever your pet is around. If your pet can’t get to the door, the door can’t be scratched. Simply place a piece of low-extending furniture across the path to the door, or a block of wood – any obstruction will do. This might make it a bit annoying to get to the door, and it won’t change anything about the pet’s behaviour, but it will stop the issue as long as the object remains. It’s a simple, not particularly elegant solution, but it can be enough if it’s for a limited time. If the problem is largely caused by your animal needing a place to sharpen their claws, the issue might be that no alternative is available to them. Many cats instinctively look for a place to use their claws, and a lot will take to furniture and doors to help out. Getting them a dedicated scratching post will lessen the problem immensely, though you will have to teach them to use it instead of the alternatives. For this, we recommend a combination of the above things. Putting the idea in your animal’s mind that the door isn’t for scratching with water or deterrent (or physically blocking it), while also demonstrating that the scratching post is available for their use, should hopefully wean them off one and onto the other. However some cats are extremely set in their ways, and this process could take months or could never quite stick no matter what you do. Keeping your pet’s claws dull will reduce the need for your cat to begin clawing, even if it doesn’t remove the problem completely. And in fact this is a recommended practice, as it helps to minimise damage from any accidental swipes to people or other objects. 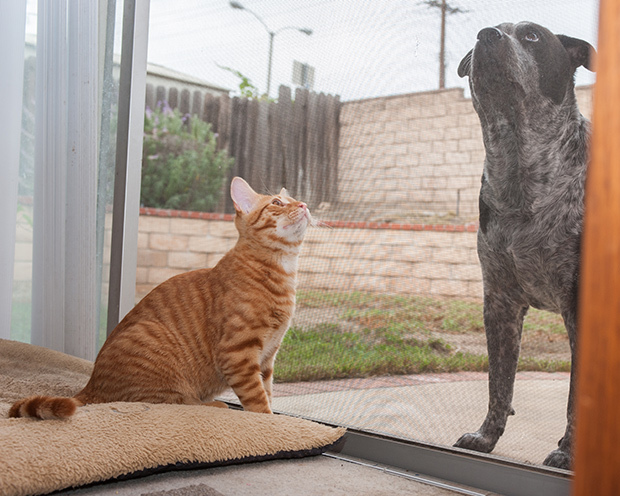 For a large dog, or a cat that just won’t stop, we recommend trading in your current screen door for a strong, pet-proof screen that will withstand even the most ferocious attack. Pet-protection shields are made of durable, scratch-proof materials that won’t buckle under a mis-timed doggy charge or get mangled by feline claws. CommandeX screens are made from 316 Marine-grade Stainless Steel that has passed National Association of Testing Authority investigations based on how it stands up to applied force, and its ability to be cut and pulled on both the frame and door. If you’d like to find out more about our products and how they could help you, send us a message or call on 1300 720 838 today.